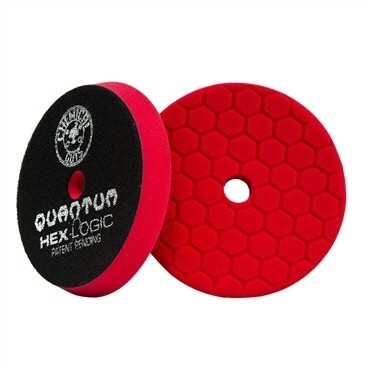 Red Quantum Pads are extra soft finishing pads. While cutting and polishing pads remove paint to restore gloss and shine, finishing pads have no cut and only spread the perfect coat of sealant or wax for protection against the elements and added shine. The soft spreading action of Red Quantum pads is perfect for applying the perfect coat of sealant or wax with the softest touch and minimal product waste. Use Red Quantum Pads to spread the perfect coat of synthetic sealants like JetSeal or M-Seal, or natural carnauba waxes like Butter Wet Wax, or soft paste waxes like Lava, Black Wax, or White Wax. Red pads are ultra-soft and perfect for delicate and soft paint finishes for a scratch-free shine. Spreading sealant and wax by machine uses the smallest amount of product for maximum results with minimal product use. When used correctly, finishing pads can use one bottle to seal or wax dozens of vehicles by machine. Only use Red Quantum Pads to spread glaze, sealant, or wax with a dual-action machine polisher. Spreading final coatings with a rotary polisher can leave holograms over the painted surface; only the dual-action machine mechanism is safe for spreading final protection coatings.